Forestry mulching is the single step process by which undesirable vegetation – trees, brush and stumps – is ground into mulch by mobile machinery. The mulch is generally spread as evenly as possible over the entire cutting area. This retards initial re-growth, prevents erosion, and replenishes the topsoil base. Unlike other clearing methods forestry mulching leaves no brush piles, and there is no burning and scarred land. Damage to “keeper” trees is greatly reduced because forestry mulching protects the vital topsoil layer and delicate “feeder” roots. Permitting and/or additional erosion control are generally not required. The landowner is left with a fresh carpet of mulch, which naturally decomposes into rich topsoil. Forestry mulching can be done in weather that shuts down other technologies. Most importantly, mulching is faster and more cost effective than traditional land clearing methods. 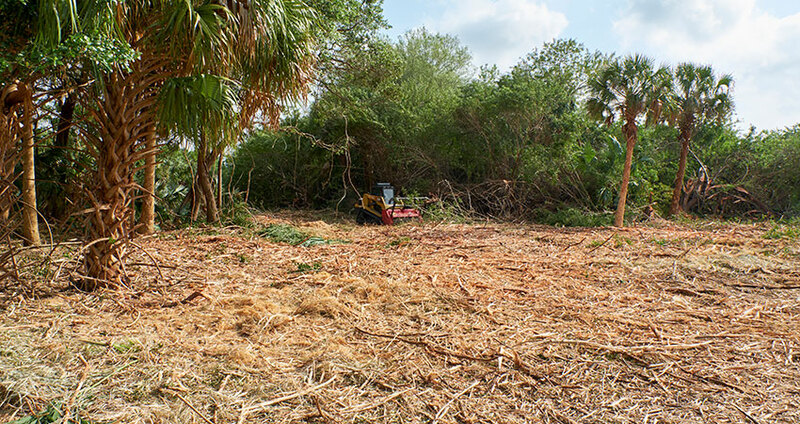 For our clients who need land cleared of unwanted vegetation and underbrush, we have the equipment to do even the largest job. Whether you are maintaining fence lines on a ranch, need fire lines cut in a state park or simply want to make your property useful, we are at your service.